Industrial DeNOx systems are most widely used in coal-fired thermal power plants due to high flue gas emissions from these power plants. Flue gas released by electricity generation units is harmful for the environment and it can cause severe health hazards to people in nearby areas. Industrial DeNOx systems employed at power plants help reduce NOx emissions. This results in better air quality and better health of employees as well as people in the surrounding areas. Though the global power generation industry is witnessing a shift toward renewable sources of energy, thermal electricity is still anticipated to account for a prominent share of the global electricity generation, especially in developing countries of Asia Pacific. Additionally, focus on protection of the environment is anticipated to rise during the forecast period. Moreover, rapid urbanization in developing countries such as China, India, Brazil, Mexico, and countries in ASEAN is likely to drive the overall electricity demand in these countries in the near future. This, in turn, is expected to boost the industrial DeNOx systems & services market in these countries during the forecast period. Thus, increase in overall electricity consumption and high share of coal-fired power plants in electricity generation are expected to fuel the demand for industrial DeNOx systems and services in the next few years. Industrial DeNOx systems and services play a vital role in curbing air pollution by reducing the amount of NOx gases released into the environment. Industrial DeNOx systems and services help improve the overall site safety and help limit the air pollution caused by flue gas emissions. Environment protection associations all over the globe have stringent rules and regulations against NOx emissions across different industries. Some of these associations include the U.S. Environmental Protection Agency and National Ambient Air Quality Standard (NAAQS). 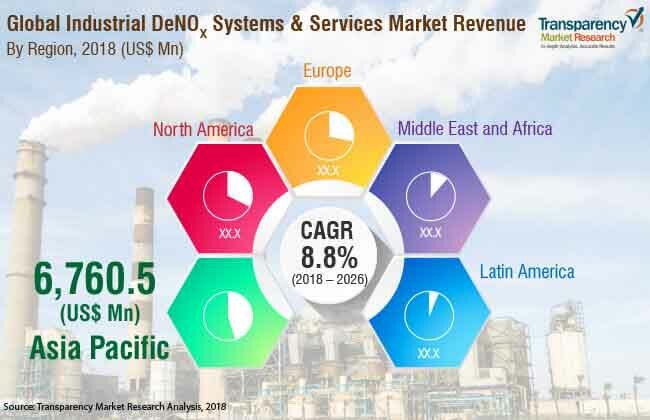 One of the major restraints of the industrial DeNOx systems & services market is lack of awareness about NOx reduction technologies in developing countries such as South Africa, India, and Mexico. This creates a significant amount of NOx emissions in these countries, resulting in air pollution. For example, several cities in India violate NOx emission standards set by regulatory bodies, due to lack of awareness about industrial DeNOx techniques. Key players profiled in the industrial DeNOx systems & services market include CECO Environmental Corp., Babcock & Wilcox Enterprises, Inc., GE Power, Yara International ASA, Mitsubishi Hitachi Power Systems, Ltd., Ducon Environmental Systems, Hitachi Zosen Inova AG, ANDRITZ Group, Babcock Noell GmbH, and Tri-Mer Corporation. Collaborations, mergers and acquisitions (M&A), geographical expansion, and development of new products are strategies implemented by major players. For instance, in January 2017, Babcock & Wilcox Enterprises, Inc. acquired Universal Acoustic & Emission Technologies, Inc. for US$ 55 Mn. The acquisition led to expansion of the former’s portfolio of industrial environment systems including gas turbine inlet and exhaust systems, custom silencers, filters, and custom enclosures. Additionally, in September 2015, CECO Environmental Corporation acquired PMFG, Inc. for US$ 120 Mn. The deal significantly strengthened the value proposition of CECO Environmental Corporation, by adding key technologies such as SCR, SNCR, separators, and silencers to its portfolio. Selective catalytic reduction (SCR) is a technology utilized for control of post-combustion nitrogen oxide (NOx) emissions from industrial plants. This technology uses a reducing agent such as ammonia to reduce NOx selectively in the presence of oxygen and a catalyst. Ammonia is injected into the exhaust gas stream and is mixed with NOx. This mixture of ammonia and NOx is passed through a catalyst bed, wherein a large amount of NOx reacts with the catalyst. Adsorbed ammonia decomposes into diatomic nitrogen and water molecules, thereby reducing the NOx level in the exhaust gas. In terms of value, the selective catalytic reduction segment accounted for a significant share of the global industrial DeNOx systems & services market in 2017, due to the superior cost-to-performance ratio offered by selective catalytic reduction DeNOx systems. In terms of volume, Asia Pacific and North America are leading regions of the global industrial DeNOx systems & services market. In terms of value, the market in Asia Pacific is projected to expand at a substantial pace during the forecast period, followed by Middle East & Africa and Latin America. The market in Latin America is estimated to expand considerably during the forecast period, owing to rise in the industrialization and increase in the demand for these systems in power plant applications in the region. The market in India, ASEAN, Japan, and China is anticipated to expand at a significant pace in the next few years, due to increase in the demand for DeNOx systems in these countries for use in various applications such as power plants, gas turbines, waste incineration plants, cement plants, nitric acid plants, and FCC units in refineries. This report analyzes and forecasts the industrial DeNOx systems & services market at the global and regional levels. The market has been forecast based on revenue (US$ Mn) from 2018 to 2026. The study includes drivers and restraints of the global market. It also covers the expected impact of these drivers and restraints on the demand for industrial DeNOx systems and services during the forecast period. The report also highlights opportunities in the industrial DeNOx systems & services market at the global level. The report comprises detailed value chain analysis, which provides a comprehensive view of the global industrial DeNOx systems & services market. Porter’s Five Forces model has also been included to help understand the competitive landscape of the market. The study encompasses market attractiveness analysis, wherein service type, type and application segments have been benchmarked based on their market size, growth rate, and general attractiveness. The study provides a decisive view of the global industrial DeNOx systems & services market by segmenting it in terms of service type, type, and application. Segments have been analyzed based on the present and future trends. Regional segmentation includes the current and projected demand for industrial DeNOx systems and services in North America, Europe, Asia Pacific, Latin America, and Middle East & Africa. The report also covers the demand for industrial DeNOx systems and services in individual service type, type, and application segments across all regions. Key players operating in the industrial DeNOx systems & services market are CECO Environmental Corp., Babcock & Wilcox Enterprises, Inc., GE Power, Yara International ASA, Mitsubishi Hitachi Power Systems, Ltd., Ducon Environmental Systems, Hitachi Zosen Inova AG, ANDRITZ Group, Babcock Noell GmbH, and Tri-Mer Corporation. Among these, CECO Environmental Corp., Babcock & Wilcox Enterprises, Inc., and Yara International ASA have been profiled in terms of attributes such as company overview, financial overview, business strategies, and recent developments. The report provides the size of the industrial DeNOx systems & services market for 2017 and forecast for the next nine years. The market size has been provided in terms of revenue. Market numbers have been estimated based on service type, type, and application of industrial DeNOx systems and services. Market size and forecast for each service type, type, and application segment have been provided for the global and regional markets. In-depth interviews and discussions with several key market participants and opinion leaders have been conducted to compile the research report. Primary research represents a bulk of research efforts, supplemented by extensive secondary research. Annual reports, press releases, and relevant documents of key players operating in various end-use industries have been reviewed for competition analysis and market understanding. Secondary research also includes recent trends, technical writing, Internet sources, and statistical data from government websites, trade associations, and agencies. This has proved to be the most reliable, effective, and successful approach for obtaining precise market data, capturing market participants’ insights, and recognizing business opportunities.